French artist and an English painter? 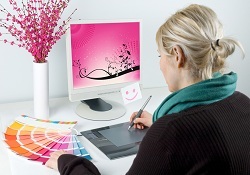 Answer: An irrefutable interest in color. Chelsea is a Manhattan, New York neighborhood. While the people who live there may be colorful and lively, the art galleries tend to steer clear of the vibrant hues found in other parts of the city. This summer, however, an art exhibit has moved in and is brightening up this subculture of New York. Entitled, “Art on Color,” the exhibit is anything but chromatic. In fact, the two men responsible for this three month showcase made it their mission to paint every wall of Gemini G.E.L. at Joni Moisant Weyl a different color, leaving only one wall white. “It’s always important to know where to start and where to stop with color,” said Peter Stamberg, partner at Stamberg Aferiat and Associates, an architectural design firm based in New York City. 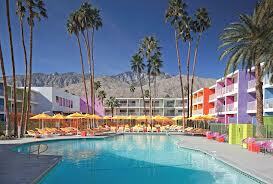 Together with Paul Aferiat, the two architects designed some profound establishments, like the Saguaro hotel in Palm Springs and Shelter Island Pavilion, which are known for their bold color and architectural designs. In addition to designing buildings, they are also the masterminds behind the exhibit “Art on Color.” Although, it can be said that more than two great minds engineered this idea. Stamberg and Aferiat invited great artists like John Baldessari, Ann Hamilton, Ellsworth Kelly, Roy Lichtenstein, Man Ray, Brice Marden, Robert Rauschenberg, James Rosenquist and Joel Shapiro to feature their work in Chelsea this summer. However, even Hockney is hesitant to claim his title as a color authority. He advises the men behind “Art on Color” to go to Matisse when they are “having trouble with color.” After all, the colorful works of art created by the French artist display the magnificent qualities art takes on when it is infused with bold color. Stamberg and Aferiat are bathing New York with color this year, but with designs popping up all over the United States, who knows where their touch of color will land next. This entry was posted in "out of the box" art, Architectural, architecture, Color, Color as art, Colorful, colorful cities, David Hockney, Exhibit, Henri Matisse, New York and tagged architecture, Art exhibit in Chelsea, Art on Color, bold color, building design, color, colorful, David Hockney, exhibit, Henri Matisse, New York Art Gallery on August 11, 2014 by segmation. Lighthouses have long been viewed as beacons of hope and symbols of beauty and strength. Today lighthouses are mainly symbolic and intended more for decoration than function. However, in the past they were quite useful and, in some cases, lifesaving, being navigational tools for maritime pilots. Lighthouses have traditionally been scattered across coastlines, reefs, and shoals that may present danger to someone. Lighthouses are also popular due to their representation of service to others in spite of impending danger. The lighthouse’s history is quite fascinating. In ancient times, mariners relied on fires built high upon hilltops to guide them safely to shore. Over time, the fires began to be built upon platforms to improve people’s ability to see them from afar. While ancient lighthouses were used for safety purposes, they were mostly intended to mark ports. The season of modern lighthouses began with the construction of the primary Eddystone lighthouse in 1695. America’s first lighthouse was located in Boston Harbor in 1716. As maritime activity in America increased, so did the presence of lighthouses. 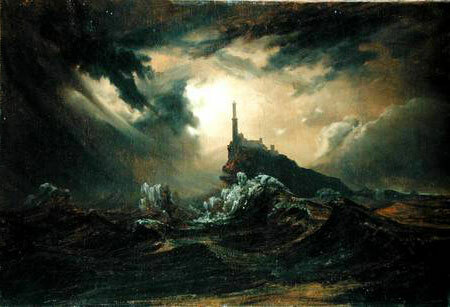 Paintings – There are a number of famous paintings with lighthouses as their main subject. One such painting is Monet’s The Seine Estuary at Honfleur. Others include Stormy Sea with Lighthouse by Karl Blechen, Seascape with Lighthouse by Charles Codman, and Ceyx and Alcyone by Richard Wilson. Photography – Many photographers have been captivated by lighthouses and have made it their aim to capture them in photography. One such photographer is Jean Guichard. Guichard began to focus heavily on lighthouses in 1989, and since then has taken many pictures of the greatly loved shelters. Are you a lighthouse lover? If so, have you ever considered painting them for yourself? Even if you don’t consider yourself an artist, you can be one today – see more details here). This entry was posted in Art, landmark, Light, Lighthouse, paint by number, painting, photographs, Segmation and tagged ancient, architecture, Art, arts, beacon of hope, beacons, beauty, began, built, intended, lighthouse, lighthouses, Paint on June 17, 2012 by segmation.